You are currently browsing the tag archive for the ‘Leopold Stokowski’ tag. ‘Hollywood Bowl’ merges two genres that had become quite popular by the late 1930s: the concert cartoon and the Hollywood caricature cartoon. The result is pretty uneven, but nonetheless, ‘Hollywood Bowl’ is one of the most original cartoons to sprout from the Walter Lantz studio. The short opens with a gala night at the Hollywood Bowl, with several famous stars in the crowd, e.g. Edward G. Robinson, Hugh Herbert, Greta Garbo, Groucho Marx, Clark Cable, Charles Laughton, Ned Sparks, Bing Crosby, W.C. Fields, and Charlie. Leopold Stokowski is the conductor, conducting Franz Schubert’s unfinished symphony with the help of a few gloves. This leads to a great and very imaginative scene, in which we watch ghostly images of the gloves playing instruments on a black screen, and Stokowski casting a huge shadow on the bowl, which changes into a greyhound, which changes into a swallow. At that point this poetic part cuts back to the Hollywood caricatures. As Schubert has left the symphony unfinished (quite literally), it’s up to the stars to finish it, Hollywood style, which means that radio star Ben Bernie starts conducting a swinging tune, with help of Fats Waller, Rudy Vallee, Benny Goodman, Fred Astaire, Jack Benny and Cab Calloway. This part reuses a lot of animation, and is a not too convincing end to the cartoon. ‘Hollywood Bowl’ is a very interesting entry in Walter Lantz’s oeuvre, but it’s harmed by a lack of story, rather bad voice imitations and at times sloppy animation. Nevertheless, the Schubert sequence is no less than marvelous, and the cartoon’s opening is greatly helped by Frank Churchill’s inspired score, which is simply packed with countless classical tunes. Notice that some of the backgrounds use photographic material, a very rare feat in classic cartoons. Bugs Bunny is singing nearby a villa, where a huge opera singer, called Giovanni Jones, is practicing. The singer is heavily disturbed by Bugs’s performance and without arguing destroys our hero’s banjo, his harp and his tuba. 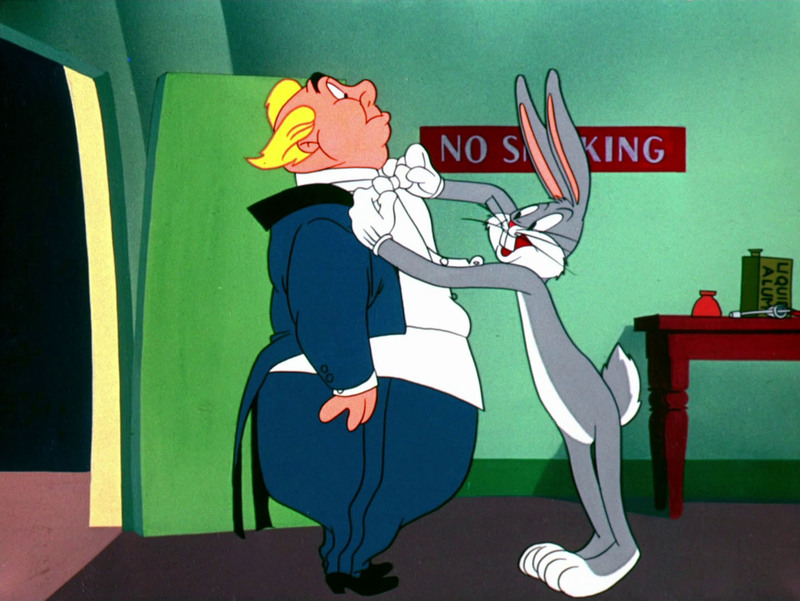 Only then Bugs is prompted into war, which he reserves for the opera singer’s concert at the Hollywood Bowl. What follows are great blackout gags featuring a string of opera tunes, with Bugs as ‘Leopold’ as a major highlight. This impersonation is an obvious reference to star conductor Leopold Stokowski, famous for conducting ‘Fantasia’ (1940). Bugs destroys the conductor’s baton, to direct with his hands only, like Stokowski does. From now on he controls the singer almost like a puppeteer. Bugs finally destroys his opponent by making him sing a ridiculously long high note, which tears the complete bowl down. With cartoons like ‘Long-Haired Hare’ director Chuck Jones really came into his own: it shows Jones’ attitude to Bugs Bunny, who, in Jones’s cartoons, is only a misschief when provoked. Giovanni Jones is one of Bugs Bunny’s particularly large adversaries, following The Crusher (‘Rabbit Punch‘, 1948), and the warehouse manager in ‘Hare Conditioned‘ (1945). ‘Long-Haired Hare’ also shows Jones’ love for high culture, like opera. For instance, we can clearly detect a painting by Roussau le douanier decorating the opera singer’s villa. Jones’s love for opera would lead to two of his most famous and best cartoons, ‘The Rabbit of Seville‘ (1950) and ‘What’s Opera, doc?‘ (1958), which also feature Bugs Bunny. In 1950, the Hollywood Bowl would be visited by cartoon characters again, when Tom & Jerry both tried to conduct in ‘Tom and Jerry in the Hollywood Bowl‘. In ‘Slick Hare’ Elmer works as a waiter in a restaurant full of celebrities. 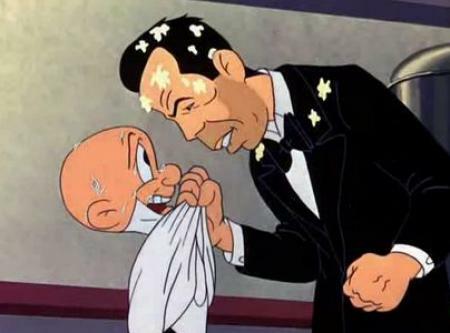 Humphrey Bogart (voiced by Dave Barry) is one of the costumers, and he tells Elmer to bring him a rabbit or else… By chance, Elmer discovers Bugs in his kitchen and what follows is a wild chase involving more celebrities, like The Marx Brothers and Carmen Miranda. ‘Slick Hare’ is a hilarious cartoon. Highlights are a well-timed pie throwing sequence and a a great dance routine by Bugs on an irresistible samba, animated with gusto by Gerry Chiniquy. The cartoon contains some more caricatures of Hollywood stars, like Leopold Stokowski, Frank Sinatra and at the end, Bogart’s wife, Lauren Bacall.